Sadly, this is the last leg of our trip. 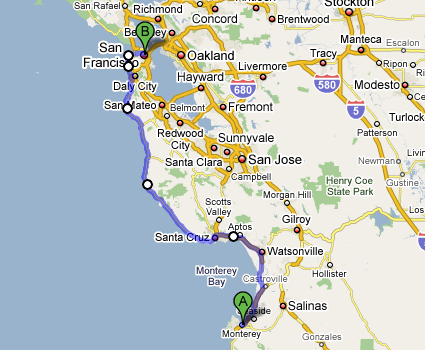 We're heading up Highway 1 back to San Francisco :-( . There's not likely to be any more posts until we get back, but then we'll have loads of news to write about. This last leg is a lovely route. I've been along this route before and it's very pretty and goes through lots of well known places. I think it's probably the 2nd most famous highway in the US after Route 66.